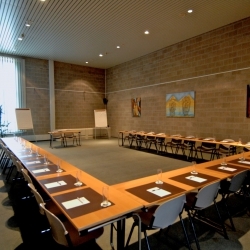 Bremberg has 10 professionally furnished meeting rooms for 2 to 240 people. All rooms are equipped with pen, paper, water, flipchart and free wireless internet. On request, we can also supply other audiovisual equipment such as a beamer, a micro, a smartboard, etc. Feel free to contact our employees for a quotation. You can download our standard brochure below. We have free parking for 150 vehicles.